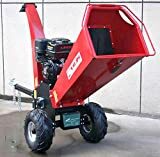 Choosing the best wood chippers on the market is not an easy task with hundreds of wood chippers online sharing same features. You need to go beyond the features of the chipper and look at the size of your property where you will use the chipper. You also need to look at the power, feeding capacity and design of the wood chipper before making a purchase. However, that problem is easily solved if you’re reading this as we’ve selected some of the leading wood chippers on the market. Make sure you go through our reviews above and order a wood chipper that best suits your needs. Snow Joe is a powerful 14-amp motor for effective shedding and chipping and branches. The chipper works effectively cutting branches and twigs up to 1.5 inches in thickness into nutrient-rich garden mulch. It is a compact design with a 6-inch wheel to maneuver around with ease. For safety, it features a locking knob and a safety hopper. This ensures the motor does not operate when the chipper is opened. GreatCircleUSA is a multi-functional three-in-one wood chipper with a seven horsepower 212cc engine to get the job done fast. 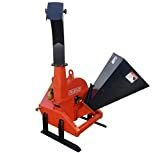 The chipper design comes with a top hopper for chipping, back vacuum inlet for loading the leaves and shredder and a small side chute for the limbs and branches. It is a versatile machine that can handle up to three inches of wood without any issue. Overall, this machine is safe to use and comes certified by CARB and EPA3. This is a compact and sturdy wood chipper with a powerful 15-amp motor to chip woods faster. It is a versatile machine with 1 5/8-inch cutting capacity to handle most woods in your garden. The chipper features two 6-inch legs to allow for easy mobility on rough surfaces. It is safe to use with overload protection, a locking knob, and a safety hopper. The locking knob helps prevent the machine from running when loose or open. The LawnMaster wood chipper is another top selection on our list with a 15 amp motor and a 1.5-inch cutting capacity. The chipper can, however, handle bigger woods depending on the type of wood. It is durable and easy to use. The 8-inch wheels provide easy mobility on the ground. There is a further collection bag. Overall, this is a safe machine for the environment with a 10:1 mulch ratio. This is an electric wood chipper with a 15-amp motor for efficient and quiet wood shredding. The powerful motor shreds and chips woods easily. It is an ideal choice for creating nutrient-rich mulch from branches and twigs. The machine can shred branches and twigs up to 1.5 inches thick with ease. It is a compact design with durable 6-inch wheels for improved mobility. A locking knob mechanism prevents it from turning on when loose or opens to avoid injuries. Overall, it is a great wooden shredder with ETL certification and a two-year warranty. The Farmer Helper wood chipper is a low total chipper ideal for farmers with tractors. The chipper easily fits with tractors for easy shredding. It also features an adjustable discharge funnel that helps the height and direction. For maximum exhaust flow, the machine features air intake vents on both sides. This is a high-performance shredder with angled cutting action that helps pull twigs and branches. Overall, this is a high-performance wood shredder ideal for big gardens. This is probably the most powerful wood chipper with a massive 420cc OHV engine for maximum performance. 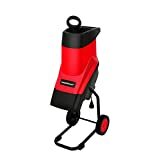 It is one of the leading gas powered shredders with a portable design to allow for easy transportation. You can carry it on your truck or roll it to the work area with ease. The shredder features large 13-inch pneumatic tires that easily roll on rough terrains with ease. Overall, this is a fantastic choice a built-in handle and low center of gravity. This is another versatile gas powered wood chipper with a powerful 15-amp HP LIFAN 420cc engine to get the job done quickly. 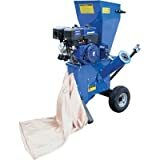 It is a large wood shredder with a large 5-inch cutting capacity for branches and ¼-inch capacity for mulch. Other great features include a centrifugal clutch that helps protect the engine. The cutting steel blade is hardened for long-lasting use. It also features an adjustable deflector vane to allow easy chute discharge. Buy today with confidence and get a one-year warranty on parts. 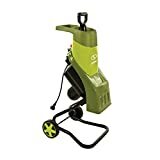 Greenworks wood chipper is a leading brand in the industry with a 15 amp motor and a maximum cutting capacity of 1 3/8-inches. It is a versatile shredder to clear most of the twigs and branches in your garden. The 7-inch wheels of the shredder make transportation from point A to B a lot easier. Other amazing features include a push paddle for easy feeding and hopper safe. You also get a large collection bag to allow for easy disposal. The YARDMAX is a durable and easy to use wood chipper capable of handling large branches up to 3-inch thick. This helps save time and energy giving you value for the long term. It features massive self-feeding chute for easy handling of long branches. You are guaranteed solid and durable parts that can handle tough jobs over an extended period. The chipper blades are easily accessible allowing for easy maintenance. Overall, this is a quality chipper with heavy-duty Briggs and Stratton 6.5 HP engine. 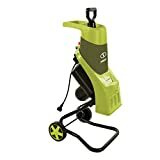 You can easily turn the branches, twigs, and leaves in your garden into environmentally friendly nutrient-rich mulch today by using one of these amazing wood chippers. Make sure you choose the best wood chipper from our list above to get value for your money. The ten reviewed wood chippers above are the best, and you will never go wrong picking one.